Fri 1 World Day of Prayer, St Edward’s, 6pm. St David’s Dinner, N.R. Old School Hub. Llanfair Waterdine W.I. Tessa Gavin: Upcycling Clothing, Everest Hall, 7pm. Sat 2 Bingo, St Ed’s Hall, 7pm. Knuicklas Castle Cabaret, Everest Hall, Llanfair Waterdine (venue change). 7.30. St David’s Celebration, Knighton Comm. Whitton W.I. East Radnor Home Support, Whitton Hall 7.30pm. Stowe & Stange W.I. The Comm Dressing Room, 3.30pm. Ash Wed Holy Communion, St Edward’s, 10.30am. Communion, St Peter’s Evancoyd, 7pm. Coffee morning. The Hub, N.R. 9.15-11.30. Art Group starts, The Hub N.R. 2-4pm. Felindre W, Mark O’Donald – Fitness Taster, Felindre Village Hall. 7 30pm. Knighton Flick, The Comm. 7.30pm. Tref-y-clawdd W.I. Tower Gallery, 7.30pm. New Rad W.I. New Rad Vill Hall, Spring Table Sale, 11am – 3pm. Fri 8 First meeting of ‘Living Fruitfully’ 1 Ystrad House, Knighton, 10.30-12 noon. Sat 9 “A Sabbath Rest” day, Knucklas Baptist Chapel. 10am – 4pm. Music in N.R., N.R. Comm Hall, 7.30pm. Sun 10 Music Night, the Hub, New Radnor. Mon 11 Teme Valley Gardeners’ ‘Ringing the changes’ Knucklas CC 7.30pm. Tue 12 First meeting, Lent Group at Victoria House, Knighton, 3-4pm. Craft Club, Knucklas Comm Cent, 2-4pm. Wed 13 Communion + Lunch, N.R. Hall, 11am. New Age Curling, Knucklas Comm Cent. 7.30-9.30pm. Floral Arts, Prest Mem Hall, 7.30pm. 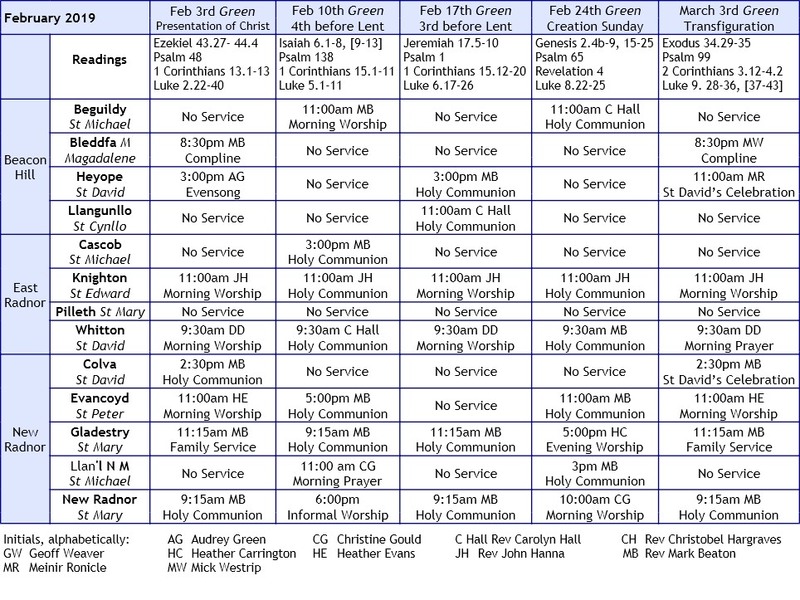 Thur 14 Theology Circle, Kni Meth Ch, 11-30-12.30. Quiet Hour, 1 Ystrad House, Kni, 10-11am. Aspects of Faith, Bleddfa Church, 7pm. Life Balance, the Manse, Knighton. Chatterbrook W.I. Prest Mem Hall, 7.30pm. N.R. Over 60’s, 10 Pin Bowling, meet at the Eagle at 10am. Sat 16 Coffee Morning, St Ed’s Hall, 10am. Film Night, Supper, The Hub. N.R. Craft Afternoon, Walton Vill Hall, 2.4pm. Tue 19 Gladestry W.I. ‘Cancer Research’ Vill Hall, 7.30pm. Wed 20 Coffee morning. The Hub, N.R. 9.15-11.30. Fri 22 Quiz Night, N.R. Comm Hall, 7.30pm. Prayer Meeting, St Peter’s Evancoyd 2:30pm. Sat 23 Men’s Shed Open Day, Knighton. Sun 24 Communion, St Andrew’s Norton, 9.30am. Knighton Concert Society, St Ed’s Hall, 3pm. Tue 26 Diocesan Clergy Synod Llandrindod Wells, Mark and others out for the day!! Sing Mozart Requiem, Weobley Hall, 10-4. Walton Village Hall AGM, 7pm. Mother’s Union, Young Mums’ Pamper Evening. The Hub, N.R. 7pm. Wed 27 Prayers, Church Barn, Gladestry, 11:30am. Thur 28 St Mary’s Gladestry Annual Vestry Meeting & PCC 7pm Gladestry Village Hall. Sat 30 Pudding & Punch, Everest Hall, Llanfair Waterdine, (W.I.) 7.00pm. Second Hand Book Fair, St Ed’s Hall, 10-12. Sun 31 Knighton Concert Society, St Ed’s Hall, 3pm. 1 April New Rad W.I., N.R Vill Hall, 7pm. 3 April Samaritan Selection Event, Llandrindod Wells. 4 April Ministry Area Forum, Gladestry Vill Hall, 7pm.